Welcome back to Masterplots Theater! All month we’ve been talking about writing individual masterplots, but what if you’re deliberately writing a story in two genres? What the heck is that? Well, I’d call that a “mashup”, or for the purposes of the A-Z Challenge, an “X Meets Y” masterplot. But the real question is: should you write a mashup? Or should you stick to one genre? After all, mashups are either breakout hits or dismal failures. Done wrong and they can mess with your whole story and make you wonder why you ever committed to such a frankenstein-like project. However, done right and you’ll wow the masses. 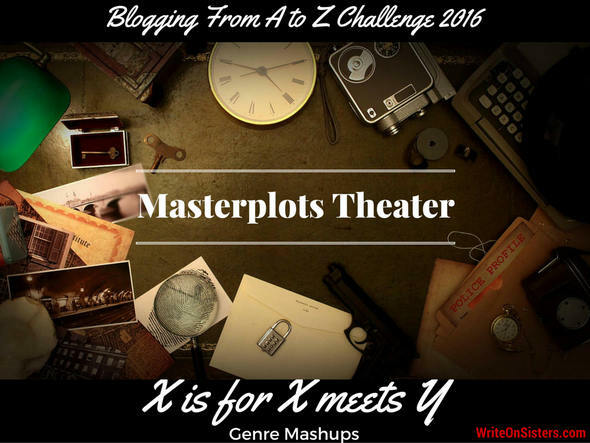 The defining element of an X Meets Y masterplot is that it not only uses but embraces two or more genres equally. This means that each genre gets the same level of screen time and importance. For example, adding a bit of comedy to your horror flick doesn’t make it a mashup. That’s just a horror film with some funny lines. Same with a romantic comedy. If it’s a romance with a couple funny situations, it’s still just a romance. But if it’s a fully flushed out Love Story with comic throughlines and laughs throughout the entire tale, that’s what we now call a Rom-Com — a mashup so popular and prevalent it has become it’s own genre. Because of this dual-genre thing, two plots are generally required for an X Meets Y story. It’s important to note that these plots could be told separately, but together they make mashup magic! The plots will intertwine either from the get-go (like in SHAUN OF THE DEAD) or gradually (like the episodic murder mysteries and season-long zombie plague story arc of iZOMBIE). Some masterplots are heavy on the character arc (like Rite of Passage or Love Story) and some are not (like Adventure or Horror). Likewise, some masterplots require lots of action (like Pursuit and Escape) but others don’t (like Institutionalized or Buddy Love). Armed with this knowledge, aim to combine plots with opposing characteristics. I feel this is one reason why SHAUN OF THE DEAD works so well — the action-packed zombie horror juxtaposes perfectly against the heartwarming romance. Finally, the brilliance of the X Meets Y masterplot is its wide audience appeal. For example, people who don’t generally like horror flicks enjoy SHAUN OF THE DEAD because it’s also a romantic comedy. So if done well, this masterplot can be a hit! · 2 GENRES: Cop procedural (Mystery) meets zombie horror (Thriller). No wonder I love this show so much — it is literally my favourite genres and masterplots together, with a dash of Comedy (but not enough to make this a triple mashup). · 2 PLOTS: In every episode there is the murder-of-the-week mystery and also a zombie plot. The murder plot and the zombie plot often seem unrelated at the beginning, but reveal themselves to be connected by the end of the episode. However, it would be absolutely possible to tell the story from one perspective (cop-Mystery) or the other (zombie-Thriller), but they’re more fun together. 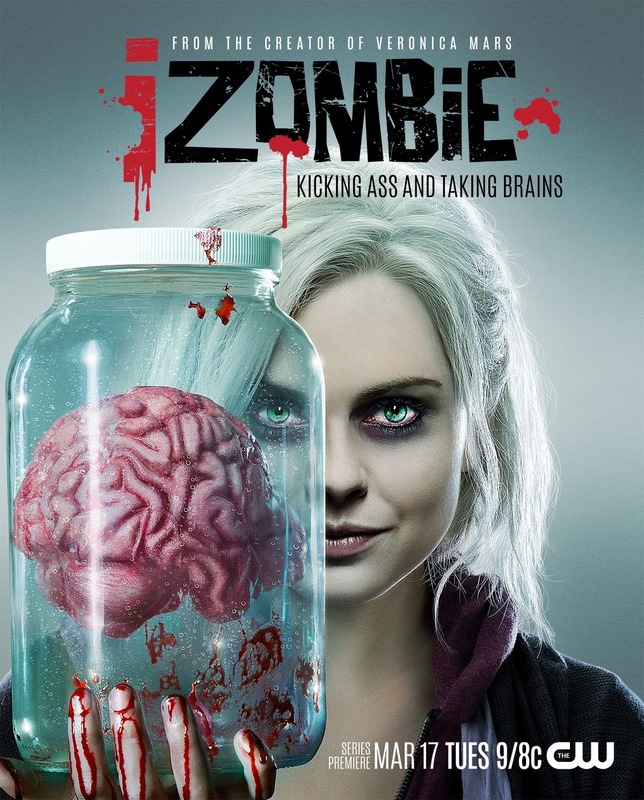 · OPPOSING PLOT CHARACTERISTICS: Mystery plots are less action-heavy than Thrillers, and we see this in how the iZombie detective scenes are more brain-teasers (the audience trying to solve the mystery along with Liv and Clive) and the paranormal scenes are more brain-eaters (thrills and chills). *Sorry for the lame zombie joke; I couldn’t resist. · WIDE AUDIENCE APPEAL: I can only speculate about this since I haven’t done an in-depth survey on the show’s viewers, but I do know that my boyfriend and I both love iZombie despite our different tastes in TV shows. Plus, it was just renewed for a 3rd season, so its ratings must be good! Books: ABRAHAM LINCOLN: VAMPIRE HUNTER by Seth Grahame-Smith (historical + paranormal), THE LUNDAR CHRONICLES (fairy tale romance + dystopian quest), OUTLANDER by Diana Gabaldon (historical romance + sci-fi / fantasy), PRIDE AND PREJUDICE AND ZOMBIES by Seth Grahame-Smith (classic lit + horror). Thank you for joining us today. We hope you enjoyed X is for X Meets Y and we invite you back tomorrow for our next installment of Masterplots Theater, Y is for Yarn. So… have you ever tried to write a mash-up? Haha, this gets me wanting to try my hand at a genre mashup story, something the more out there the better. I think another classic mash-up is historical fiction with nearly any other plot. Some writers weave them so deftly, you wonder where the history ends and the other story begins. I think Jazzfeathers should stick with her books and continue to pursue – she just hasn’t found the right agent yet. I never thought I’d like a mashup, but I do love Outlander, Westworld and Jerry McGuire – Not into horror though, so mashups like Shawn of the Dead are a no go. Guess I have a weak stomach! Fantasy Romance, absolutely! I tell my friends I write Jane Austen meets contemporary fantasy (which is, in itself, a kind of mashup, as it inserts science and computers in a fantasy world). I think mashups can really work, but they have to be devoted to fleshing out both sides, as you said. Otherwise, it feels incidental and can even feel contrived, like the author or publisher/editor was just trying to reach a broader audience by tacking on another, popular element to a story where it didn’t belong. Extremely good point, Andrea! The second genre must not feel tacked on. It should be an integral part of the story. Thanks for the comment! It’s true – fantasy and paranormal (zombies, vampires, etc) are popular genres to mashup with more realistic genres like historical, comedy, romance and mystery. But I’m the kind of reader who likes a bit of supernatural thrown in with reality, so I guess that’s why I enjoy a good mashup. Thanks so much for reading and following, Sheila! I can see that. I’m more of a thriller, crime kinda gal. I’ll admit, I read a few of the fantasy (book club) and if I spent more time with the genre, perhaps I would enjoy as much as millions of others do. We’ll see. Thanks for stopping by and taking part in the conversation. As for books… I don’t think I’ve read many mash-up stories, but Karina Sumner-Smith’s Towers Trilogy comes to mind. It’s a blend of fantasy, sci fi, horror, and dystopian / post-apocalyptic elements; and it features some of the most richly developed world-building I’ve seen in the past couple years. And thanks for the book recommendation. This challenge has certainly increased my To Read pile! I love genre mashups. I have a soft spot for Fantasy Romance (like Mary Robinette Kowal, fr’ex). All of my published novellas are mashups of one kind or another. I’ve tried writing straight up genre fiction, but I keep going on genre-blenders. I don’t think there’s anything wrong with that. Probably makes you stand out from the crowd! Thanks for the comment, Heidi. A friend of mine (who beta read the novel) told me that I’m probably having problems getting requests from agents because they fail to place the novel neatly in one genre. But I don’t know. It may be, of course, that the story isn’t good enough. Still, in my trilogy the two genre are inseparable. I don’t have two different plots intertwining, but I have a definitely speculative plot happening in a definitly historical setting. And of course the setting influeces the plot, that’s why I think it is a mushup. I wholeheartedly agree! Writing a mashup is more difficult than sticking to one genre. Good luck with your historical fantasy trilogy!